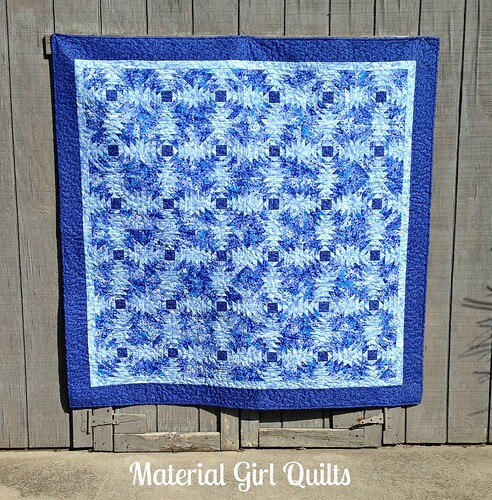 I've been successful for two months in a row now in completing my local quilt guild's 10 in 10 challenge! 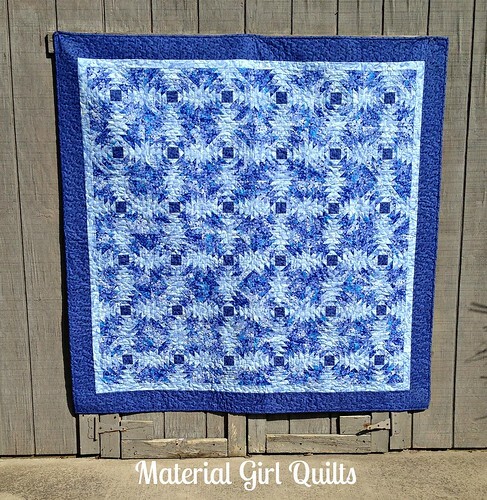 At last month's meeting they pulled number 4 out of a hat and on my list that was my Blue Pineapples quilt. Amazingly I've had this quilt top done for...well we don't really need to go into how long exactly :) So, all I needed to do was quilt and bind it. As I had previously mentioned, that was the big hang up for me on this project...how should I actually quilt it?! 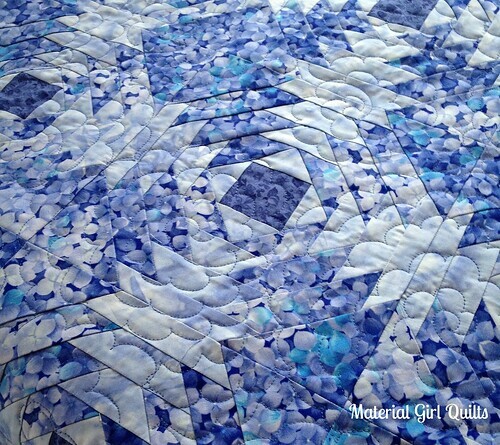 Thanks so much for all of your suggestions and I think the majority agreed that this quilt needed some softer lines in the quilting to contrast with all of the angles in the quilt. 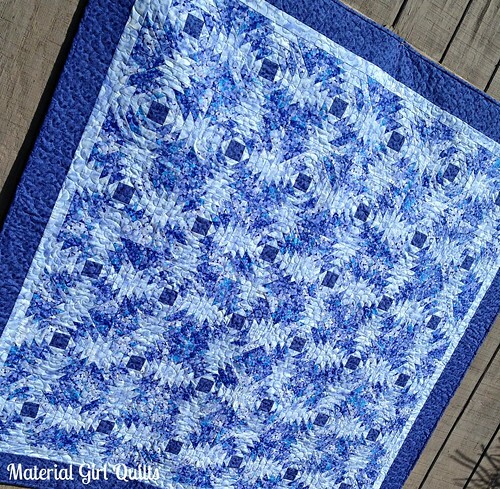 I once again pulled from one of my favorite books "Free-Motion Quilting with Angela Walters" and with my Aurifil 50 wt. 1128 thread, used the Flower Power design. I've been able to get the hang of this design pretty well and I also just love the texture it creates, especially after it has been washed. These photos aren't the best for showing the pretty shades of blue because the sun was a bit bright, but I did the best I could in the few minutes I had available today. The photo above probably is the best representation of the colors in the Blue Pineapples quilt. I also want to share that when I started this quilt, it was in a class with a number of other experienced quilters. 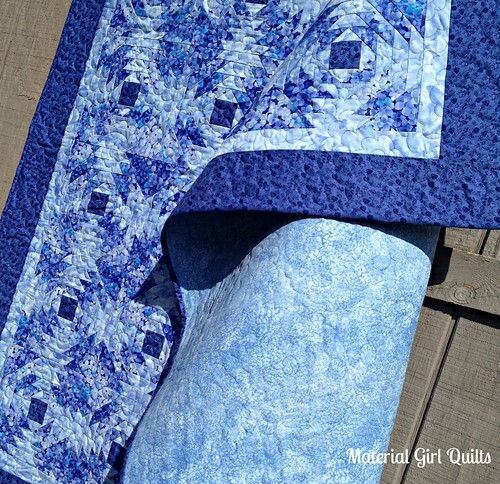 I remember when I was selecting my fabric, almost all of them told me that my choices weren't going to work well in this quilt because there wasn't enough contrast in the fabrics. I agree that there isn't much contrast, but that's what I was going for. And I still (yes years later) love my choices. 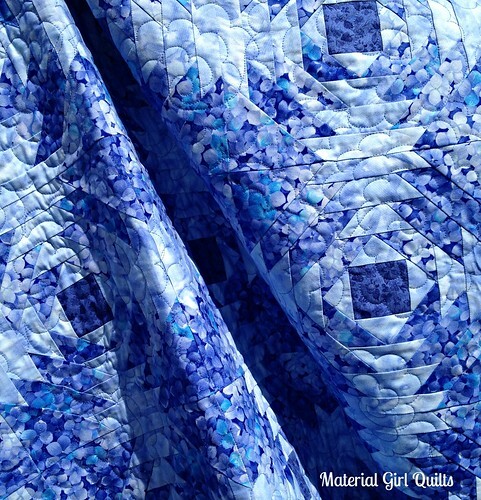 So, lesson to all of you newbie quilters, you can learn a lot from more experienced quilters, but never let them discourage you from choosing fabrics that you absolutely love just because it isn't their taste. If you are the one making it, you should certainly choose fabrics that YOU love and not worry about what others think. The pineapple quilt pattern has always been one of my all-time favorites (might actually still be number 1). So, thankfully my quilt guild challenged me to FINALLY finish this. I'm so happy with it now that it's done and I can snuggle under it whenever I want. :) I'll find out tomorrow what number we have to complete for next month. We'll see if I can keep up the streak of getting these UFO's done.